Aerosol cleaning introduces a continuous supply of clean, unused solvent throughout the entire bench cleaning process of printed circuit boards (PCBs). Aerosol cleaning prevents the introduction of new contaminants. 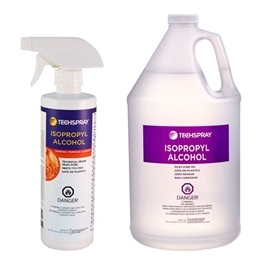 While there are some obvious pros of aerosol cleaning, questions remain as to whether this method of benchtop cleaning can consistently and reliably clean a circuit board. This paper examines the role that different variables play in aerosol cleaning and offers guidelines to improve an aerosol cleaning process. For testing purposes, we're using boards were built using Kester’s FL250D (Sn63Pb37), no-clean paste to attach two QFNs and one QFP. Two components (QFN B and QFP) were fluxed, with Amerway #100 Type "R" Non-Activated Rosin Flux, to simulate rework. QFN A was untouched to act as a control and also so that it could be checked for cross-contamination. Two drops (from glass pipette) of flux were added, one to the top and one to the bottom of QFN B. Four drops were added to the QFP, one to each side. The boards were then reflowed using the handheld heat/air gun at 400oF for two minutes. 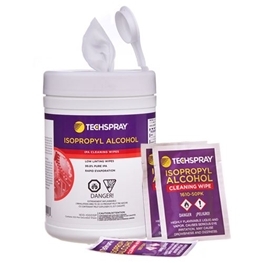 Techspray’s G3 Flux Remover (part #1631-16S), aerosol was then used for benchtop removal of the flux. This solvent was chosen due to its cleaning effectiveness of Type "R" Non-Activated Rosin Flux, the flux used to simulate rework. The objective was to use a solvent with a known cleaning effectiveness in order to study the impact of the solvent delivery. Board cleanliness was determined by a visual inspection under 64X magnification. The use of the straw attachment allowed for a more controlled spray, thus eliminating excessive solvent waste. The straw was also useful in directing exactly where the solvent went. This allowed the user to guide the solvent under the component. Without the straw attachment, the solvent was sprayed at the target area (for instance, the sides of the component); however, much of the material was wasted on areas surrounding the target and very little ended up traveling under the component (see Figure 1). Figure 1: Visual comparison of an aerosol spray without (left) and with a straw attachment. Best results were obtained when both corners and sides of each contaminated component were addressed, as opposed to focusing on only one or the other, corners or sides. Directing solvent directly into the corners helped to break up any flux dams located there. Because the corners were cleared first when the sides of the components were addressed, the number of channels opened to allow the solvent to pass was greater than it was when corners were not addressed first. The more open channels available, the greater the opportunity for the flux to be exposed to the solvent, and as a result, the higher likelihood that all flux trapped under the component will be able to flow out from under the component. The choice to use an oscillating or stationary spray was dependent on the size of the component. For a small component it was sufficient to use a stationary spray on the component sides; however, for larger components, a cleaner board was achieved when the spray oscillated back and forth across each side of the component. This oscillating spray gave the solvent the opportunity to flow up, under the component from many angles, similar to the way that the flux had. How does the angle of spray affect efficiency? An exact straw angle of 30o, 45o, or 60o to the board had no impact on the cleanliness of the board. General downward or upward angles were sufficient. In order to make the most of the straw, think about the direction in which the residues need to travel. When trying to remove residues from under a component, spray close to the board at an angle that guides the solvent under the component. When all of the residues have been removed from underneath the component, spray from on top of the component, angling out along the edges to push any residues out, away from the component. Handheld brushes and swabs left the board looking dirtier than it started. Brushes and swabs spread partially solvated flux around the components which then dried, leaving a white residue. None of the polyurethane foam swabs held-up well in this application. Foam swabs became flimsy when saturated with aggressive solvents and were easily torn. Another problem with handheld tools was that the solvent evaporated too quickly. Best results were achieved when a final rinse was utilized (see Figure 2). The key is not to let the board dry out. When the board dries, the partially solvated flux dries leaving the white residue mentioned earlier. 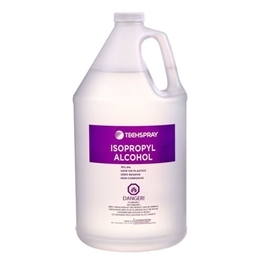 A slower evaporating solvent, like IPA, would avoid the evaporation issue but should be followed by a rinse (see more details on rinsing below). In addition, some solvent may travel under the component during scrubbing, but without the force of an aerosol spray, the likelihood that the residues under the component will be pushed out is slim. Figure 2: Board cleaned with a handheld brush. The components were wetted, and then the brush was wetted and used to scrub the contaminated area. The board in the first picture did not undergo a final rinse. The board in the second picture did (Note: all flux was not removed). Some solvent cleaners come with a brush that attaches directly to the spray head, and the solvent flows through the brush at a slow rate (see Figure 3). This is particularly common in defluxers available in Europe. Brush attachments produced results that were a step above handheld tools, due to the benefit of a constant supply of virgin solvent. However, they did not produce the same level of cleanliness observed in aerosol only cleaning. The brush attachment allowed for scrubbing problem areas, which can be beneficial. However, the force of an aerosol through a straw attachment produced similar results. Brush attachments, like handheld tools, have the potential to introduce new contaminants. In addition, for a brush attachment to reach its full potential, a separate aerosol is required for cleaning under components and for the final rinse. Like handheld tools, without the force of an aerosol spray, some solvent may travel under the component during scrubbing; however, the likelihood that the residues under the component will be pushed out is slim. Because the use of a brush attachment requires that the target area remain saturated, the target area remains in a solvent pool throughout the cleaning period. This increases the likelihood that residues may only be relocated on the board instead of being removed completely. A final rinse, then, was found to be especially important, to ensure that all of the residues were removed from the board (see Figures 4 and 5). There is a commercially available brush system that provides a separate brush mechanism for cleaning, which is continually fed by the aerosol can. No cleaning advantages to this system were observed compared to a brush attachment. A brush system or attachment is often used to reduce solvent usage, but this advantage is greatly decreased if a proper rinse is applied. Figure 4: Board cleaned with brush attachment (no separate aerosol was used). No pre-rinse or final rinse utilized. White residue shown around QFN B and QFP, respectively. Figure 5: Board cleaned with brush attachment (separate aerosol was used for pre-rinse and final rinse). Some white residue shown around QFN B and QFP, respectively. The final rinse was found to be a necessary step. This step ensures that all of the solvated flux residues, which have been removed from under and around components, flow off the board completely, and are not simply relocated. At first, glance, what we recommend may seem over-the-top. Why go through all the trouble and expense of thoroughly cleaning under the components when no one can see the difference? It all comes down to the reliability requirements of the electronics. For disposable electronic devices assembled with no-clean flux, an overall rinse may be all that is needed for acceptable results. If higher reliability is required, greater care is needed, with the techniques noted above, to prevent latent failure of the final device from ionic contamination. Spending the time and effort up-front is often money well spent.